Maino speaks on behalf of New York City and tells Trinidad James, “We want to take him to the dentist”. 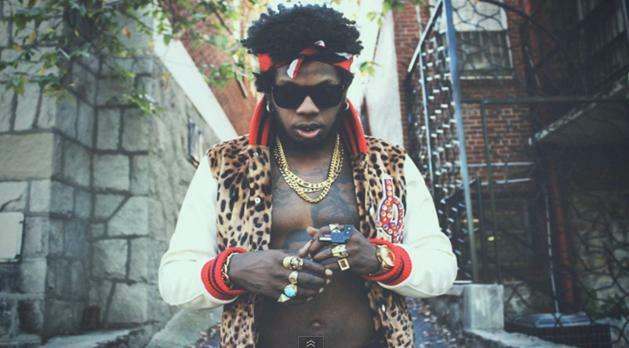 After his recent rant about the south running NYC, Trinidad James returns tonight with a new track titled “L.I.A.A.R.S.” which stands for “Lames Is Always Acting Real… Sure,” Listen to this new track above. Trinidad James goes on a rant in NYC about how the music scene there is not what it used to be. Casino gets features from Tyga and Trinidad James for the official remix to his single ‘Killin It’. Migos release their video for ‘Jumpin Out Da Gym’ featuring Trinidad James and Riff Raff. Directed by Gabriel Hart. ‘YRN2′ is set to be released on December 10th. UZ releases a video for his collaboration with Trae Tha Truth, Problem and Trinidad James ‘I Got This’. Shot at this year’s SXSW festival. Watch the video above. Young Dro links up with French Montana, T.I., Trinidad James and DJ Drama to create the remix to his single ‘FDB’. After releasing the trailer for this last week, Childish Gambino delivers the official short film titled “Clapping For The Wrong Reasons”. This film is 24 minutes long and features Chance The Rapper, Danielle Fishel, Flying Lotus, Trinidad James and more. Travi$ Scott recently performed at the “Vitamin Water Uncapped” event in NYC. During his performance he brought out special guest Trinidad James to perform as well. Watch the full performance above. Here is new material from Trinidad James that did not appear on his mixtape ’10 PC Mild’ mixtape which dropped earlier today. This one is called “Catch A Cold” and features Future and Yo Gotti.